Tina and myself are excited to be attending Birmingham’s (UK) first major indie author event on Saturday. You may recognise one author from our blog, Pat Spence, who will be attending. We reviewed her YA Paranormal ‘Blue Moon’ last year! If you’re not booked up for anything this weekend, please come along and join in the fun!!!! I thought it was about time I let everyone in on the fact that I will be an attending author at a huge signing event in July 2015. 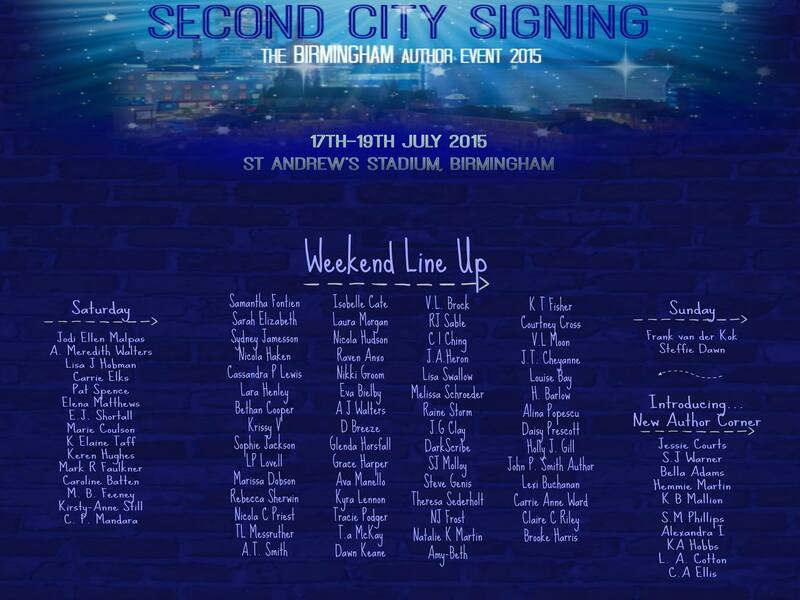 It’s called Second City Signing and will be held at St Andrews in Birmingham. I am so excited, I literally can’t stop thinking about all the awesome people I am going to meet, authors and readers alike. As you can see, I will be signing on Saturday 18th July only, so if you want to come and see me, make sure to get your ticket!